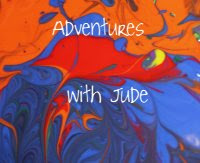 Adventures with Jude: Follow the Ball! For our family, there are four seasons: Spring Training, Baseball, the Playoffs, and the Off Season. We almost automatically add "Play Ball" to the end of the National Anthem. Baseball is our thing. When Neal was younger, he played Little League. 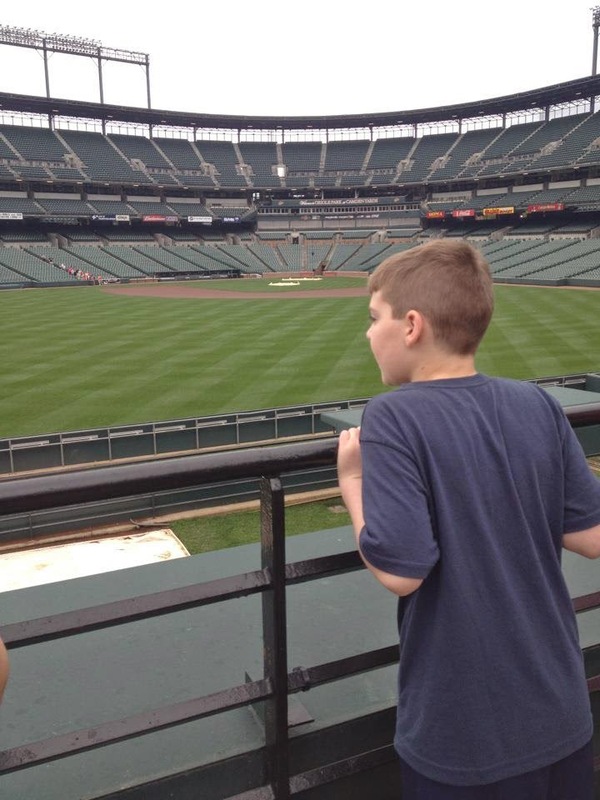 As he got older, he and his parents would make weekend trips to different ballparks. 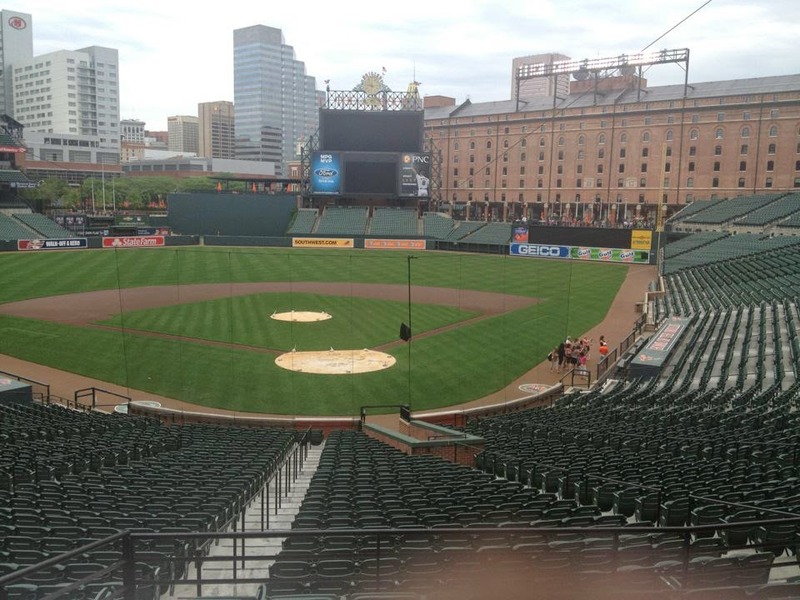 They would sometimes stay relatively close to home - catching an Orioles game at Camden Yards, or a Phillies Game at The Vet (Veteran's Stadium) - but sometimes they'd venture further afield. 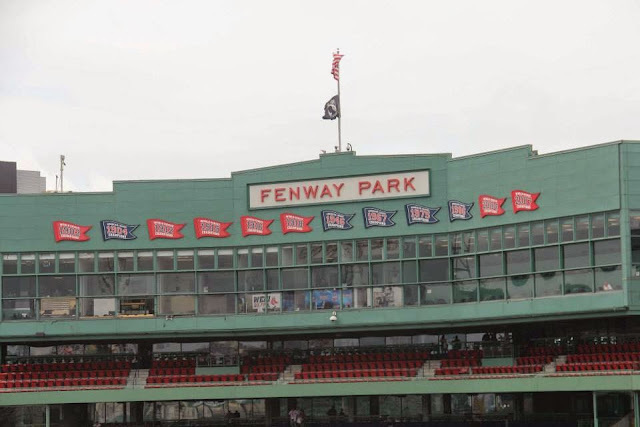 One trip found them sitting in the historic seats of Fenway Park in the rain to see Wade Boggs and the Boston Red Sox play while on another Neal watched a Toronto Blue Jays game from his in-stadium hotel room! Now, not only can you get tickets to see a game, but many clubs offer tours of their home stadium. Matthew and Neal had the opportunity to tour Oriole Park at Camden Yards on a school field trip. 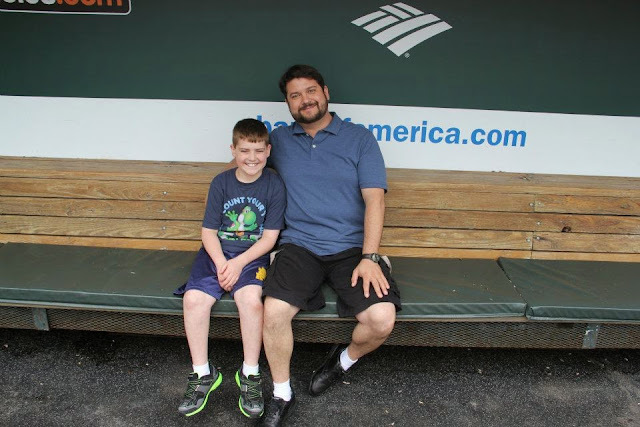 They had a great time exploring the stadium and even had a chance to sit in the home team's dugout. Having been on the Camden Park tour, that sparked the idea for us to continue the "Follow the Ball" tradition. Now that the big boys are a bit older and able to travel easily, we have started our own baseball treks. (The younger ones had a weekend with Mimie (Neal's mom), so they had plenty of fun themselves.) 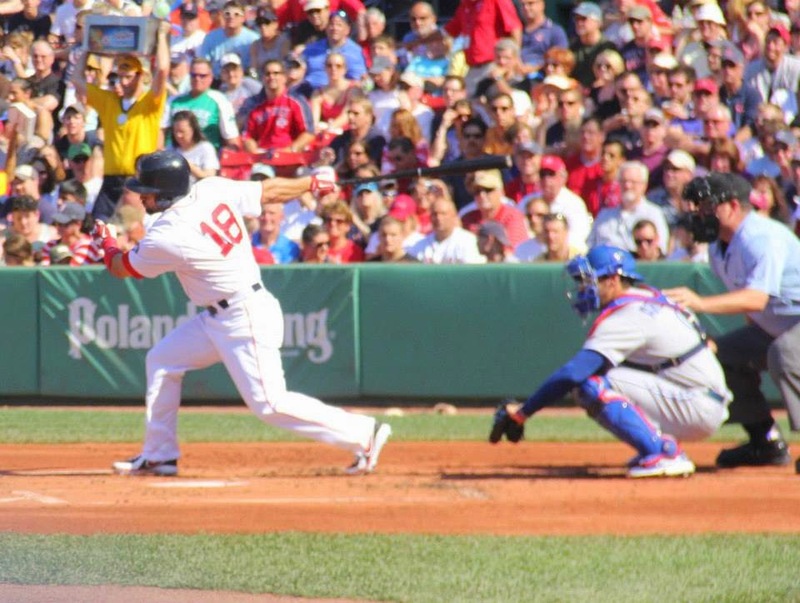 Last year, we went to Fenway Park and had a great time touring the stadium. We had a guide who told us lots of history about both the stadium and the team. I have to say, that as much as I love the Phillies, and the sightlines in the new Citizens Bank Park are all great, there is definitely a special feeling sitting in Fenway Park and soaking in the history of over 100 years of baseball. Isn't this sweet? 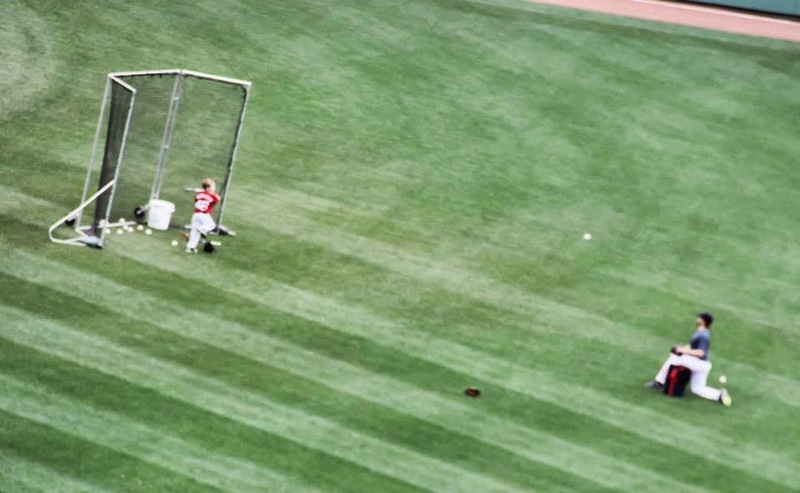 Here's one of the Sox players' sons taking "batting practice" with Dad. 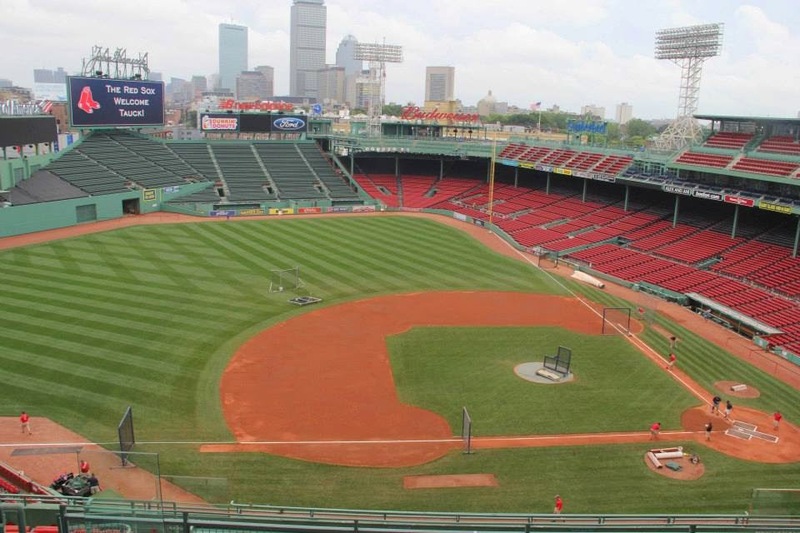 Can you imagine having Fenway's outfield for your backyard catch? At the end of the tour, we went into one of the clubhouse rooms. A septuagenarian came out, with a broad grin on his face. He commented that the "young buck" may have have given us a tour, but he had the "Chick Magnets," and then pulled his fists from behind his back. 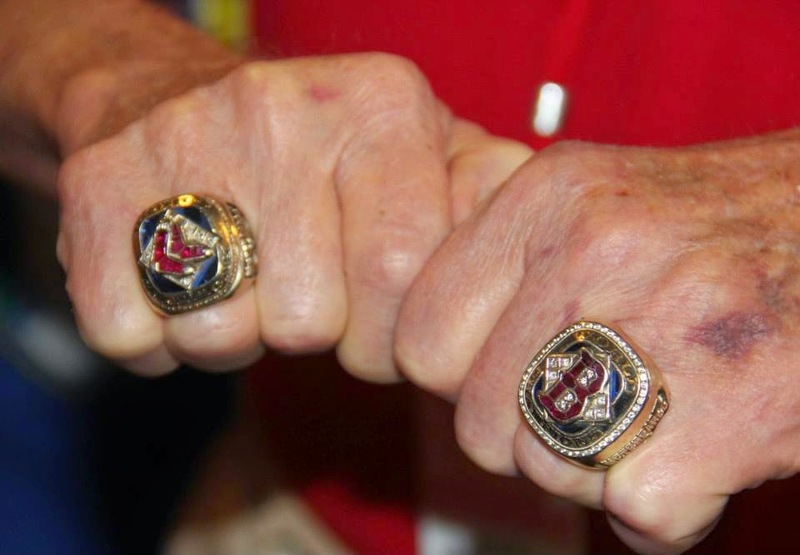 These are the 2004 and 2007 World Series rings. I wish we were going back this year...I'm curious if he'll have a buddy wearing the 2013 Championship ring, or if he'll be extra-sparkly. Plus, we had a fantastic time at the game. Although it was a rare loss for the 2013 Sox, we got to see former Phillie Shane Victorino live up to his "Flyin' Hawaiian" nickname. This year we have tickets to see the Yankees play at the "new" Yankee Stadium. (We'll make sure to leave our BoSox gear at home!) Having been to Fenway, we'd also like to go to see Wrigley Field and soak in the history there. Some offseason, we'll also go to Cooperstown, NY to the Baseball Hall of Fame. Neal and I were there as kids, and it would be great to revisit it with the kids. The last few years, we've had a ticket package to the Philadelphia Phillies games. Getting to go to the game is hotly contested now that there are four tickets and four kids who want to go. (Dad automatically gets a ticket, since they need a grown up to get in!) Last year, we took Jude to his first game and now he is part of the rotation. During the summer, they all have to take turns going, but this year, Luke found an extra hidden blessing. 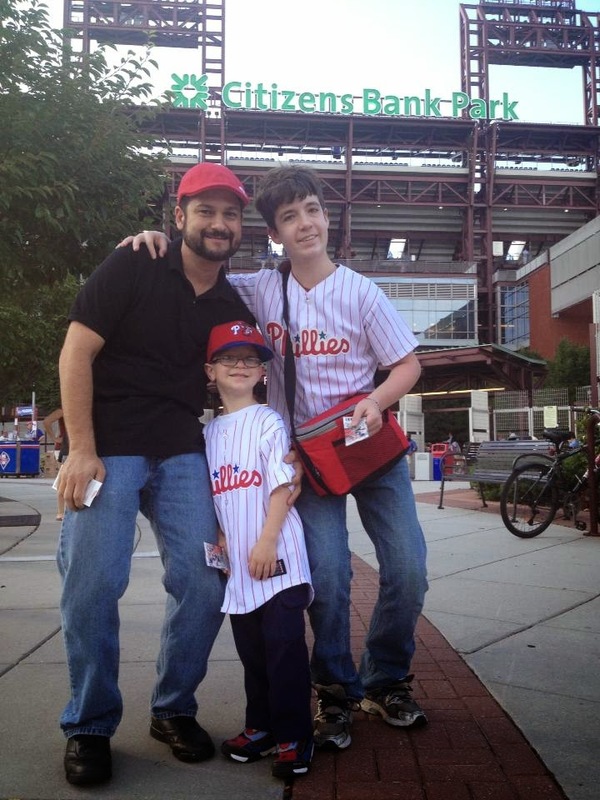 Since he was homeschooled and didn't have to be up and out the door at a specific time, he and Jude automatically got to go to the weeknight games during school while Matthew and Celia had to stay home and go to bed. A September mid-week night game...homeschooling for the win! If you don't have the chance to travel to tour Major League parks or catch a game, look around and see if there is a local Minor League team nearby. Minor leaguers truly play for the love of the game (they're not getting paid the same big bucks as the big names -- some of them wind up making less than enough to buy their own peanuts! ), and are often very involved in the community and with their fans. I know one family who has watched a special minor leaguer move up the ranks from AA to the big leagues -- not only is this young man an amazing ballplayer, but he's just an amazing person. Get to know your local MiLB teams...you may find some inspirational people, too! The baseball diamond is often called the "Field of Dreams." 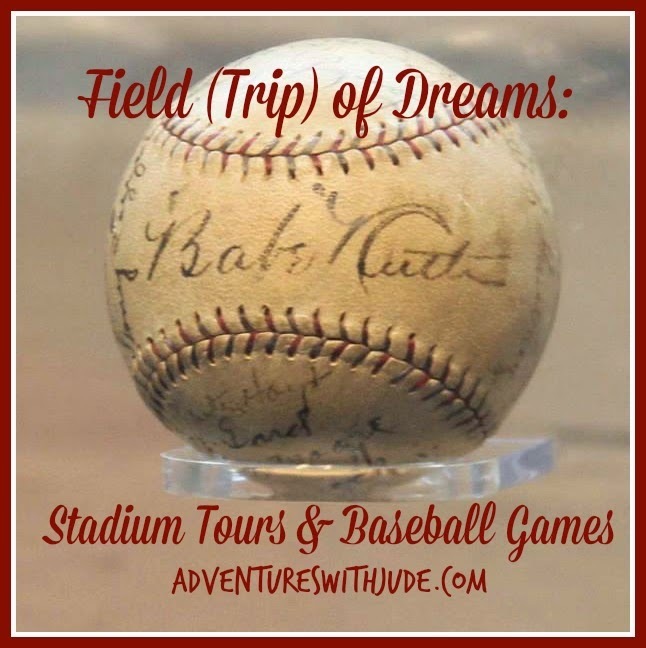 I'm not sure that we dream of visiting every stadium -- but we do wish to see many of the fields. Take us out to the ballgame! B is for Baseball! 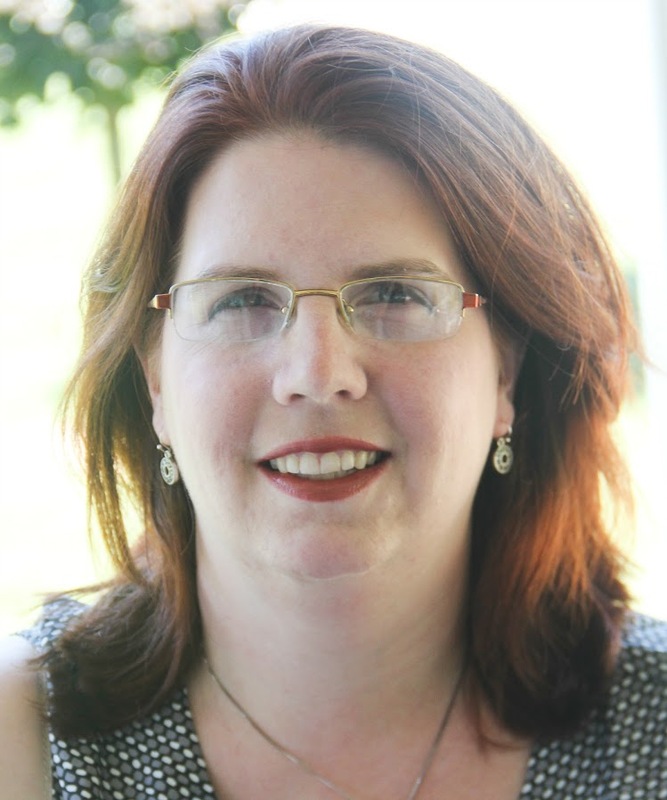 Click on the icon to read what others are writing about this week! 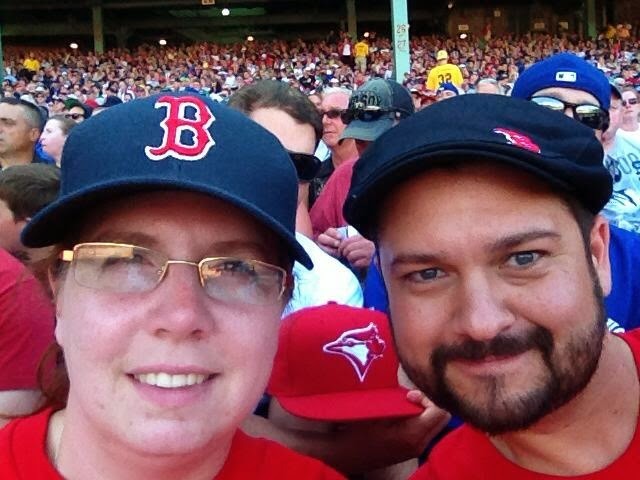 LOL Love the Blue Jays photobomb! (I'm a Jays fan!) My oldest son just planned a baseball road trip with his best friend and they are really excited about it. My DH and I have gone on baseball road trips too - way back before kids. We have visited Cooperstown, and when it works out for us to catch a ball game when we're on vacation, we like to do that too. What fun! I never even thought of the possibility of doing something like that. I grew up going to the old Tiger's Stadium with my dad, and I just loved it. I have very fond memories of baseball games every summer with him and getting autographs from The Bird, and wondering why the crowd was always yelling, "boo! boo!" when Lou Whitaker was up to bat. LOL If only I knew where those old programs are now. Comerica Park just isn't the same for me, but I'm sure we'll be taking our young ones there as time goes on. I love baseball!!! I would so love to do what you've been doing! We have a minor league team here and a few years ago my special needs daughter was selected to throw the first pitch. It was a game dedicated to the Elks Therapy program. She got to meet players and has a signed baseball. My teams are the Mariners, the Twins and the Cubs. I've not seen a Major League game in years, though my girls have :D. Love this post!